Bonewits was born on October 1, 1949, in Royal Oak, Michigan  the perfect place, he likes to joke, for a future Archdruid. The fourth of five children (three girls, two boys), he spent most of his childhood in Ferndale, a suburb of Detroit. When he was nearly 12, the family moved to [Southern California, first on the actual beach of Capistrano Beach, later to] San Clemente, California. From his mother, a devout Roman Catholic, Bonewits developed an appreciation for the importance of religion; from his father, a convert to Catholicism from Presbyterianism, he acquired skepticism. He bounced back and forth between parochial and public schools, largely due to the lack of programs for very bright students  his I.Q. was tested at 200. His first exposure to magic came at age 13, when he met a young Creole woman from New Orleans who practiced Voodoo. She showed him some of her magic and so accurately divined the future [and so successfully performed spells] that he was greatly impressed. During his teen years, he read extensively about magic and parapsychology. He also read science fiction, which often has strong magical and psychic themes. In ninth grade, Bonewits entered a Catholic high-school seminary. He soon realized, however, that he did not want to be a priest in the Catholic faith. He returned to public school and graduated a year early. After spending a year in junior college to get foreign language credits, he enrolled at the University of California at Berkeley in 1966. At about the same time, he began practicing magic, devising his own rituals by studying the structure of rituals in books, and by observing them in various churches. His roommate at Berkeley, Robert Larson, was a Druid, an alumnus of Carleton College, where the Reformed Druids of North America (RDNA) had been founded in 1963. Larson interested Bonewits in Druidism and initiated him into the RDNA. The two established a grove in Berkeley. Bonewits was ordained as a Druid priest in October 1969. The Berkeley grove was shaped as a Neopagan religion, unlike other RDNA groves, which considered the order a philosophy. The Neopagan groves became part of a branch called the New Reformed Druids of North America (NRDNA). During college, Bonewits spent about eight months as a member of the Church of Satan, an adventure that began as a lark. The college campus featured a Spot where evangelists of various persuasions would lecture to anyone who would listen. As a joke, Bonewits showed up one day to perform a satirical lecture as a Devils evangelist. He was so successful that he was approached by a woman who said she represented Anton Szandor LaVey, the founder of the Church of Satan. Bonewits attended the churchs meetings and improved upon some of their rituals but dropped out after personality conflicts with LaVey. The membership, he found, consisted largely of middleclass conservatives who were more rightwing and racist than Satanist. Bonewits had intended to major in psychology but through Berkeleys individual group-study program fashioned his own course of study. In 1970 he graduated with a bachelor of arts degree in magic [and thaumaturgy], the first person ever to do so at a Westem educational institution. He also was the last to do so in the United States[?]. College administrators were so embarrassed over the publicity about the degree that magic, witchcraft and sorcery were banned from the individual group-study program. The fame of his degree led to a book contract. In 1971 Real Magic was published, offering Bonewits views on magic, ritual and psychic abilities. A revised and updated edition was published in 1979 and reissued in 1989. In 1973 Bonewits met a woman named Rusty [Elliot], a folksinger in the Berkeley cafes. They moved to Minneapolis, where they were married, and where Bonewits took over the editorship of Gnostica, a Neopagan journal published by Carl Weschcke of Llewellyn Publications. He gave Gnostica a scholarly touch and turned it into the leading journal in the field. But the job lasted only 1 1/2 years, for the editorial changes resulted in the loss of many non-Pagan readers, who found the magazine too high brow. Bonewits remained in Minneapolis for about another year. While there he established a Druid grove called the Schismatic Druids of North America, a splinter group of the RDNA. He also joined with several Jewish pagan friends and created the Hasidic Druids of North America, the only grove of which existed briefly in St. Louis, where its membership overlapped with that of the Church of All Worlds. In 197475, Bonewits [partially] wrote, edited and self-published The Druid Chronicles (Evolved), a compendium of the history, theology, rituals and customs of all the Reformed Druid movements, including the ones he invented himself. [During this same time] he also founded the Aquarian Anti-Defamation League (AADL), a civil liberties and public relations organization for members of minority belief systems, such as the Rosicrucians, Theosophists, Neopagans, Witches, occultists, astrologers and others. [See The Aquarian Manifesto.] Bonewits sought to convince such persons that they had more in common with each other than they realized. By banding together, they could effectively fight, through the press and the courts, the discrimination and harassment of the Judeo-Christian conservatives. Bonewits served as president of the AADL and devoted most of his income  from unemployment insurance  to running it. The organization scored several small victories in court, such as restoring an astrologer to her apartment, after she had been evicted because a neighbor told her landlord that her astrology classes were black magic seances. In 1976 Bonewits and Rusty divorced, and he decided to return to Berkeley. The AADL disintegrated shortly after his departure. In Berkeley, Bonewits rejoined the NRDNA grove and was elected Archdruid. He established The Druid Chronicler (which later became Pentalpha Journal) as a national Druid publication in 1978. He attempted to make the Berkeley grove as Neopagan as the groves in Minneapolis and St. Louis, which caused a great deal of friction among the longtime members. After a few clashes, Bonewits left the organization. Pentalpha Journal folded. In 1979 he married for a second time, to a woman named Selene [Kumin]. That relationship ended in 1982 [after a brief stay in Santa Cruz, California, where he worked as a typesetter]. In 1983 he was initiated into the New Reformed Order of the Golden Dawn [the San Francisco Bay Areas best known, and stereotypically eclectic, Wiccan tradition]. The same year, he married again, to Sally Eaton, the actress who created the role of the hippie Witch in the Broadway musical, Hair. [During the early 1980s, Bonewits and Eaton were heavily involved in the California revival of the Ordo Templi Orientis, or O.T.O., best known for its most important historical figure, Aliester Crowley.] They moved to New York City in 1983 where Bonewits met Shenain Bell, a fellow Neopagan, and discussed the idea of starting a Druidic organization. The fellowship, Ár nDraíocht Féin (Our Own Druidism in Irish Gaelic), was born as a fresh Neopagan religious organization with no ties to the ancient Druids or to the RDNA, which by this time was apparently [but not exactly] defunct. Bonewits became Archdruid, and Bell became ViceArchdruid. In 1986 Bonewits and Eaton separated, and he moved to Kansas City for several months, where he worked as a computer consultant. He then returned to Berkeley but could not find work in Silicon Valley, which was in a slump [they had a glut of unemployed technical writers at the time]. He moved back to the East Coast, to Nyack, New York, near Manhattan, in November 1987, with his intended fourth wife, Deborah Lipp, a Wiccan high priestess [and married her in 1988]. He continued work as a computer consultant and worked on the building of Ár nDraíocht Féin. He also began work on a book on the creation, preparation and performance of effective religious rituals [finally published as Rites of Worship: A Neopagan Approach in 2004 and as Neopagan Rites in 2007]. The 10year gap. Bonewits has discovered, he says, a 10year gap between many of his views and their acceptance among Neopagans. In 1973 he was the first Neopagan to state publicly that the alleged antiquity of Neopagan Witchcraft (Wicca) was hogwash. The Craft, he said, did not go back beyond Gerald B. Gardner and Doreen Valiente [Now he is willing to push it all the back to the 1920s. See Witchcraft: A Concise Guide]. Bonewits was held in contempt by many for that, yet by 1983, Neopagans generally acknowledged that Neopagan Witchcraft was a new religion, not the continuation of an old one. The Aquarian Anti-Defamation League was also ahead of its time. In 197475, Neopagans were not ready to admit that they needed public relations and legal help. By a decade later, a number of such organizations were in existence. Around 1985 Bonewits began regularly discussing the need to provide social services for domestic and personal problems and drug dependencies. Neopagans, he points out, represent a cross section of the population, and such problems cut across religious lines. Bonewits estimates that as many as 80 percent of Neopagans come from non[dys-]functional family backgrounds. Neopagans, he observes, are brighter and more artistic than average, but also, therefore, more neurotic. [He now thinks much of it may be related to Aspergers Syndrome] The community has been quick to address these social issues with programs [such as various Pagan 12-Step Programs]. The above text [except for Isaacs comments in square brackets] is taken from The Encyclopedia of Witches and Witchcraft, Copyright © 1989 by Rosemary Guiley, published by Facts on File, Inc. Click here to buy it from Amazon.com! Isaacs comments are © 1999, 2005. 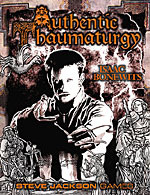 If you would like to be on one or more of Isaac Bonewits emailing lists, click here to get subscription information. We use PayPal and we recommend it! Most recently updated: January 10, 2008 c.e.